Below, I am providing my homeschool mama interview. These are my 3rd grade homeschool curriculum choices for an INFJ, somewhat hippie, somewhat conservative, Christian, beaver/lion mama with an outgoing, inventor-brain eight year old boy. I love what we have found for our family and the flexibility of our choices work great for us. I love being in charge of my own scheduling and I never have to feel behind with the choices we’ve made. I’ll include pros and cons of each curriculum choice under each selection. While repetitive and sometimes considered boring, I find that Saxon cultivates discipline and cements simple math into children’s minds forever. All of learning isn’t about having the most interesting curriculum, but rather learning to utilize what you have fully. That being said, I do not utilize every exercise in the hefty teacher’s manual. This catechism is a simple Christian catechism that can be used by many denominations with unity. You can access the songs on their website at no cost or purchase their CDs through their site or –> on Amazon. I went through my entire education from K-5 through a Senior in college without having developed a love for history. Through Classical Conversations timeline and Story of the World, I have finally developed a love for the rich history of the world and of our faith. My son has taken this journey with me and now considers history just as interesting as his favorite fictional book. Thank you Susan Bauer for writing such a vivid account of history that initiates the imagination and allows us to connect with the past! Since we are covering American history in CC, I plan to integrate the Little House series into our reading. We will probably also utilize other historical fiction in order to make the connections between American history and the actual life and plight of the people who lived it. I use the ESV version and change the wording at times to be age appropriate. Instead of giving details of adult situations, I express the situation in terms that an eight year old can understand. For instance, when Dinah is raped in the Old Testament, I explain that the man in the city took her as his wife when she was not his wife. Later as he gets older, we will begin to go over these subjects one by one so that he does have a full understanding of these passages. Discipleship is such an important task that I have in regards to my son. It’s a calling for every parent. The Go Book: Foundations lays a solid foundation for the basics of the faith. It is very easy to use since its intended to be used by anyone in the church to guide anyone else in discipleship. I love that this book helps parents to train their children to pray expecting the Lord to respond. We too often put God in a far away box, but children have not yet done this. I use this book to guide my son and myself toward opening the God box and realizing that God “is not a tame lion.” Let God be God and accept that He can speak to us in any way He desires. Pray expecting and bring forth the Kingdom of God on this earth. I’ve only read the first chapter and I’m yearning for more. How can God move when we obey and move with Him? This book set my homeschool mama heart aflame with a vision for God’s will for my family. While we at times have people question what we are doing and why we are doing it, this book allowed me to really think about why God was calling me to homeschool and the purposes that He has for my son through this discipleship process. I am not homeschooling to avoid the school system, out of fear, nor to shelter my son, rather I am homeschooling to bring God glory by educating my son personally and cultivating his desire for God. First of all, realize that homeschooling a 3rd grader is not very different from homeschooling a 2nd grader. While our beautiful children are getting older, we know them. We love them more than anyone else on the planet and that love will lead us to make the best decisions for our child. Each new stage will bring on new challenges, but you are uniquely fitted to meet those challenges. You are the best parent and best teacher for your child. You are the authority. 3rd grade homeschool children have tons of opinions, but you are in charge. Learning to respect your authority is part of their education. “I’m bored” may be a frequently heard phrase at this stage. However, remind your homeschooler that being bored is a choice. They can chose to enjoy their task or decide they are bored. Their choice. If your homeschooler runs out of activities frequently, set up stations in advance to move them onto a new task without having to be interrupted repeatedly. Ban electronics during the school day. This rids you of the incessant question “can I play . . . yet?” and allows you to enjoy your day without the distraction of technology. It only takes a week of consistency to end the electronics war. Get ready for the day. While it is so easy to just stay in PJs all the day long, most people are more productive when they take the time to get dressed and ready for the day. This is true for homeschool as well. Habits formed now will carry your children through life. Do not use sugar or food colorings during the school day. Many children react poorly to sugar and food colorings. I’ve seen mothers who wrack their brains for ideas on how to get their children to calm down and hold still . . . all while feeding their childen sugar-rich, dyed foods. Most 3rd graders are fully able to control themselves to stay seated for as much as two hours at a time, so consider feeding them foods that will help them to stay in control of their own bodies. Grace for the past and obedience for the present. 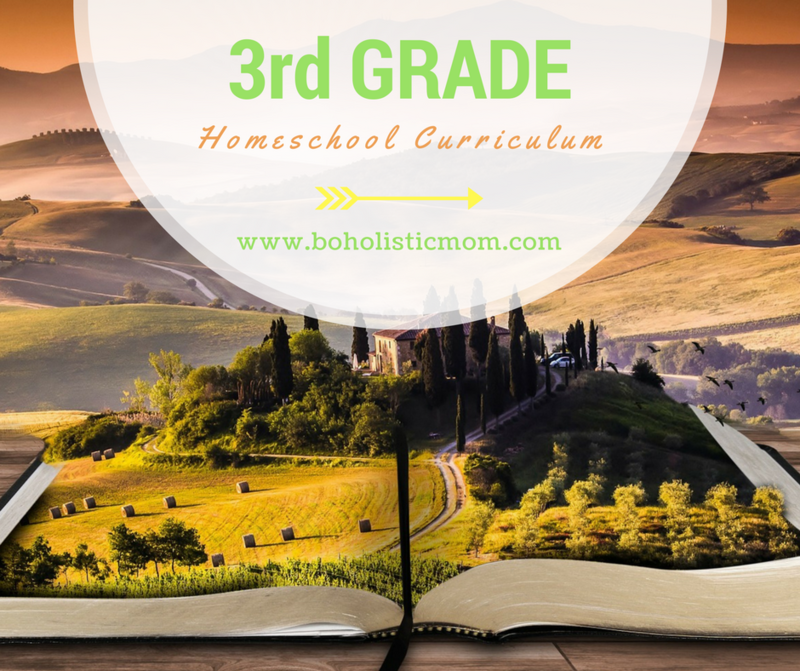 I hope these 3rd grade homeschool ideas, curriculum options, and tips will be such a rich resource for you as you guide your family during this homeschool year. Please let me know if you love any of these resources! I’d love to hear about your successes and your journey!